I started my career as a ‘Host’ at the National Marine Aquarium where I volunteered during my final year. It was a great start that allowed me to develop my ability to explain conservation and environmental issues to anyone. About a year after this, an opportunity at Dartmoor Zoo came up teaching science communication and I was lucky enough to get that. In the four years since then, I became interested in scientific research and in-situ conservation so I slowly began coordinating research at the zoo which has eventually led to the Dartmoor Institute of Animal Science being created this year. In 2013 I also started ‘The Science Assembly’ which coordinates conservation around the world and runs research projects in the South West. Due to this, I was offered an Associate Lectureship at the University of Plymouth where I am lucky enough to teach students about conservation. My career now has a lot of strange segments like bear tracking in Italy, our own sustainable coffee brand, and animal science, but they all feed into one another nicely. Since graduation, I always knew I wanted to get into conservation and research. I have always had a wide range of interests so, although my career has gone in many different directions, I have always been able to fulfil all of my passions. I think I always felt like I needed to pick one topic and that would be my career. I have learnt that you can do a lot of different things well and that you don’t always need to follow the standard path to get there, although this was tough at the start. It took about two years to set up bear monitoring in Italy. Hundreds of emails and risk assessments had to be sent to make sure the students would have a fun and productive time. The best day was when I received a photo of our first twelve students, safe and sound in Italy, trekking the mountains. It was a great feeling that happens every time we get a new conservation programme going. Volunteering is so important. I met most of the people who have become such an important part of my own career whilst volunteering. At times I have helped others for free, and when I look to hire I will almost certainly be looking at my current volunteers. 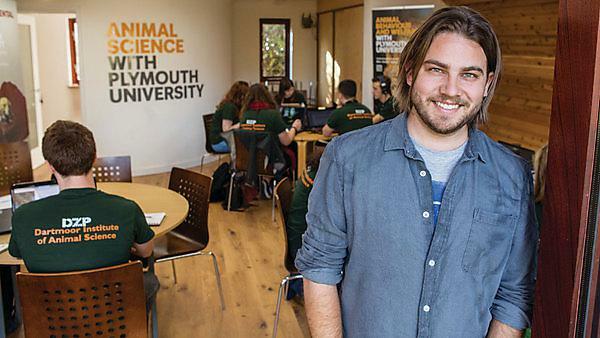 Without studying at the University of Plymouth I know I wouldn’t be doing any of what I am now. The course taught me the science I needed and to be passionate, whilst the lecturers and amazing administration staff have helped me so much in the past five years. We recently interview Adam for our alumni magazine, Invenite. Adam Cook is in good company, and that’s not just because he’s spent much of his career conserving wild bears and turtles, and working metres awayfrom big cats and Iberian wolves. No, it’s the international connection that the Plymouth environmental science graduate has with a certain Winston Churchill that is most noteworthy. Exploring his own personal ethics and the inspiration for why he does what he does, Adam takes us on a journey through his experience of being a conservationist and entrepreneur. In this video Adam Cook contemplates how the conversations we have about the future can help change the world.